Did you know that Santa Claus returns to the North Pole 1,756 times during Christmas Eve? Or that he averages about 75 million miles over the course of 31 hours? Back in 1000 AD his sleigh was originally made of bone and ivory, but now it's entirely constructed of graphite and stainless steel, even providing a durable swivel seat! Indeed, there has never been anything quite like Flight of the Reindeer. Most, if not all writers, have approached the adored Santa Claus tale in a variety of ways, but none have tried to explore the reasons behind it. 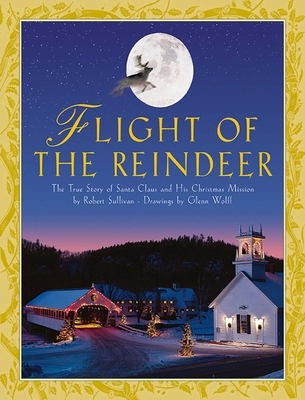 Robert Sullivan provides documentation from Santalogists, historians, zoologists, and Arctic explorers to confirm that flying reindeer are anything but a myth, and that Santa Claus does, in fact, make his trek around the globe each Christmas Eve. Glenn Wolff's insightful and profoundly detailed illustrations impeccably coincide with Sullivan's comprehensive research to provide a classic for children and their parents. A must-have for the holiday season!